Peter Hacker is the author of the four-volume Analytical Commentary on the Philosophical Investigations (Blackwell, 1980-96) the first two volumes co-authored with G. P. Baker (Second Editions, 2003, 2009) and of Wittgenstein’s Place in Twentieth-century Analytic Philosophy (Blackwell, 1996). He has also written extensively on philosophy of mind, including Philosophical Foundations of Neuroscience (Blackwell, 2003) and History of Cognitive Neuroscience (Wiley-Blackwell, 2008), co-authored with M. R. Bennett, and Human Nature: The Categorial Framework (Blackwell, 2007), the first volume of a trilogy on human nature. 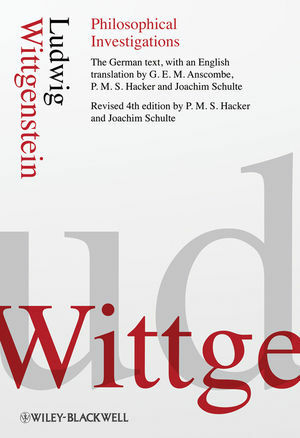 Joachim Schulte edited the authoritative critical-genetic edition of Wittgenstein’s Philosophische Untersuchungen (2001). He is author of Wittgenstein: An Introduction (1989), Chor und Gesetz: Wittgenstein im Kontext (1990), Experience and Expression: Wittgenstein’s Philosophy of Psychology (1993), and of many dozens of philosophical papers. Editorial Preface to the Fourth Edition and Modified Translation. The Text of the Philosophical Investigations. Philosophie der Psychologie - Ein Fragment. Philosophy of Psychology - A Fragment.